Microsoft has already confirmed on existence of ribbon user interface (toolbar with commands) by default in upcoming Windows 8 operating system. 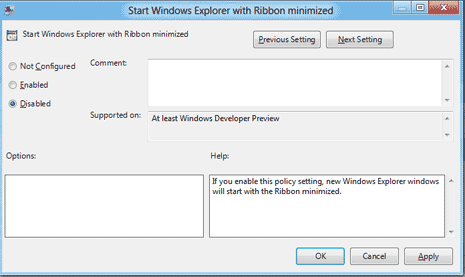 Implementation of ribbon UI is similar to that seen in Microsoft Office 2010 programs. While ribbon bar at the top of each window and folder you open on Windows 8 is useful for few users, other users might simply hate its implementation. Thankfully there are easy ways to hide and get rid of ribbon top bar in Windows Explorer on Windows 8 systems. 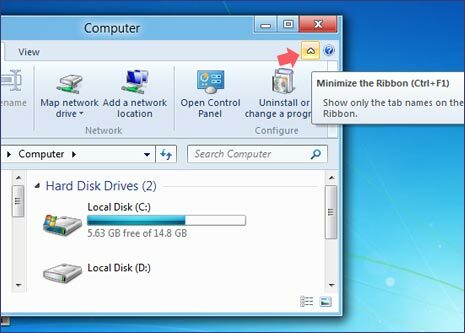 You can use following shortcut method to remove ribbon UI from Windows 8 PC. 1. 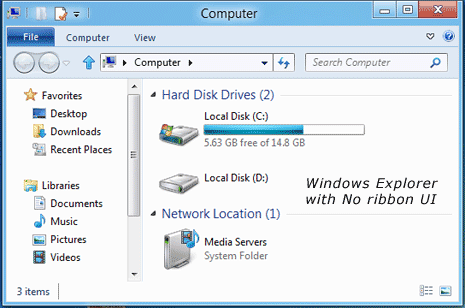 Open Windows Explorer by pressing Win + E keys. Once the Explorer Window is opened, look for small Up arrow at top right part of the window. Clicking Up arrow will hide the ribbon interface. You can click Down arrow to make ribbon interface visible again. 2. You can also use keyboard shortcut keys to hide ribbon in Windows Explorer. Use Ctrl + F1 keys to hide ribbon, press Ctrl + F1 keys again to get back ribbon UI. Easy, isn’t it? Above is temporary shortcut method to hide top ribbon UI in Windows 8 explorer. You can also use following method for more permanent implementation of ribbon UI removal. 1. Open Run box by pressing Win + R keys. Once the Run box is up, type gpedit.msc and press the Enter key. 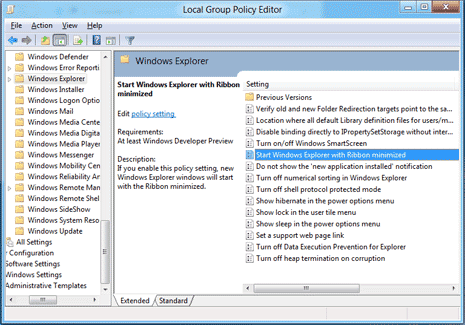 This will open Local Group Policy Editor window. 2. Then goto Computer Configuration > Administrative Templates > Windows Components > Windows Explorer in the Local Group Policy Editor window.